connecting Intervale, Kearsarge and North Conway Village. Through a unique municipal relationship with this non-profit foundation, the network is used by the local schools for their cross country ski program, training and races. In addition all Conway residents and non-resident taxpayers have FREE use of the network when displaying their resident's pass. SUPPORT US by purchasing a season pass, daily memberships, participation in our events or make a tax-deductible donation online. Your support is needed to help us continue to achieve our goals. 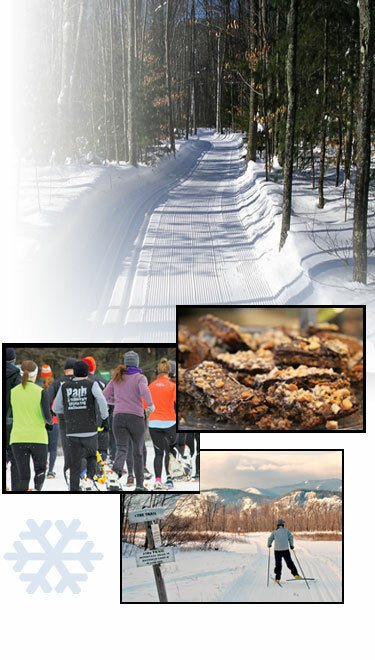 Read about our area lodging including many trailside properties offering FREE Skiing and Snowshoeing and our events including weekly guided snowshoe tours, Whitaker Woods Snowshoe Scramble, and the "Sweetest Day on the Trails", our popular annual Inn-to-Inn Chocolate Festival! The Touring Center supports the Upper Saco Valley Land Trust, an organization working with local landowners to permanently protect the lands and waters that define our communities and enrich our quality of life. Everyone purchased a daily membership at the Touring Center will have an opportunity to donate 50 cents to this organization to help protect the vistas and land available for trails.